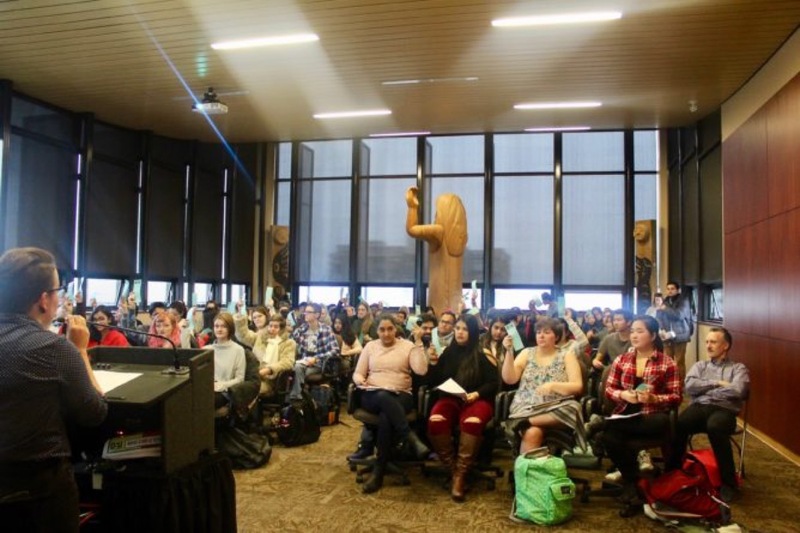 The Douglas Students’ Union Annual General Meeting 2019 was held on January 23 at the Aboriginal Gathering Place on the New Westminster Campus. Normally the AGM would take place in the DSU’s building, but as the venue is currently undergoing renovations at this time, the location was moved. The Students’ Union surpassed their quorum, with around 100 students present during the meeting. The minimum requirement was that 60 students needed to attend. The DSU has been able to meet quorum for the past several years. The AGM kicked off with the DSU describing their involvement in various campaigns and meetings with government officials over the 2017 to 2018 cycle. In particular, the DSU focused on how 10 Open Educational Resources (OERs) were accepted by Douglas College staff that year. Aahelee Bandyopadhyay, Women Students’ Representative, said in an interview with the Other Press that the best way the DSU supported students was through the OER campaign. “The open textbook resources we have now has been the most crucial and needed development so far,” she said. “We had sent a lot of emails to professors asking them to make the resources available online instead of assigning more expensive textbooks. To increase advocacy through collectives, the DSU held over 21 campaign events. Many of these were connected to campaigns by the British Columbia Federation of Students (BCFS), such as the “Fairness for International Students” campaign. Three members of the BCFS were present at the AGM, including Pesklevits and Aran Artmutlu. Artmutlu is the Director of Finance for the DSU as well as the chairperson for the BCFS. After the AGM, Pesklevits also stated in an interview with the Other Press that the DSU has officially cut ties with the Canadian Federation of Students (CFS). In June of last year, the CFS voted to part ways with the BCFS. This left 12 member unions across British Columbia without support from the CFS. The DSU was one of these unions. The DSU also revealed at the AGM that more events, volunteering opportunities, and club resources were added to campus life in 2018 at both the New Westminster and Coquitlam campuses, along with two new director positions added specifically for Coquitlam. Mitchel Gamayo, Director at Large, said in an interview with the Other Press that he thinks the new positions added will help to increase the DSU’s presence on the David Lam Campus. Dog therapy sessions were also doubled during the fall and winter semesters due to popular demand. Speaking of increases, the BCFS’s fees were increased based on inflation, with an additional one-time increase to the BCFS in 2018. The fee adjustment started on September 1, 2018. The fees for the DSU were therefore slightly increased for students. More funds were allocated for campus clubs, increasing by 20 percent to $26,500. In addition, the Health and Dental Fee was reduced by $10 per year. The language surrounding the Students’ with Disabilities Representative was amended to change the official title to the Accessibility Representative. The DSU has once again partnered with Tompkins Wozny LLP, a company that delivers auditing, tax, and consulting services. Erik Allas from Tompkins Wozny attended the AGM and gave a brief statement about the finances of the Students’ Union from 2017 to 2018. The total assets for the year as of August 31 were $6,457,923, whereas the liabilities totaled to $195,628. In all, the DSU earned a revenue of $3,418,019 with expenses mounting up to $2,732,281. The surplus for last year amounted to $685,738. The auditor found that the financial report for 2018 was successful. The meeting concluded with all motions voted in favour of and passed. Pizza was served at the end of the meeting and raffle prizes were handed out.